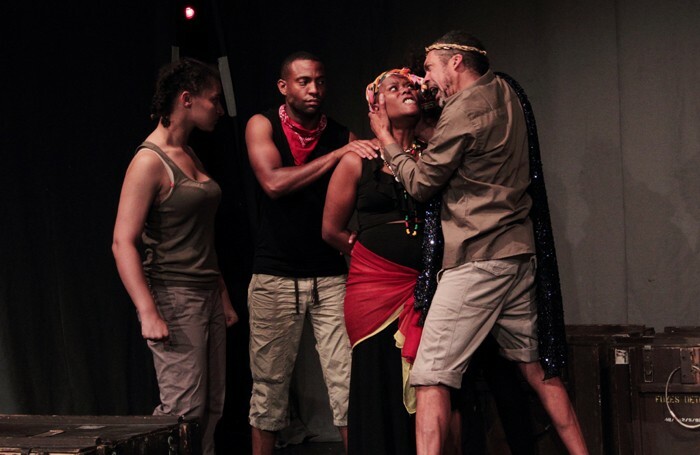 Set in a time and place that may be unfamiliar to many audience members, Black Spartacus focuses on the true story of 18th century Caribbean slave Toussaint L’Overture. He became a free man at the age of 45 and went on to lead the Haitian Revolution in 1791 and be named the first black commander-in-chief of the colony. Jim Findley breathes life and soul into the role of Toussaint, portraying his sensitivity and diplomacy with feeling. A loving father and husband, he advocates strength but also compassion – his teachings seem very progressive and often conflict with the more robust and unforgiving stance of those around him. As the story of Toussaint is not well known to many, context is important and the modern costumes really do not help to set the scene. Although a fringe show has budget limitations, it would be nice to see a nod towards authentic dress, helping to define the historical setting somewhat. Fusing music and dance with a straight play can sometimes end up disjointed, but here the traditional African dancing is a welcome contrast to the more understated scenes. Allison Mason is particularly convincing as the combative Mambo Cecile, conjuring up her dramatic and intense character with full commitment. And drummer Zozo, who remains onstage throughout the (overly long) play, fully deserves the rapturous applause he receives at the curtain call.